The one and only Gorilla Glue now exclusively available here at Zamnesia Seeds! This spectacularly potent and flavourful Indica which until recently was only available in the US doesn’t just make for incredible relaxation with a happy and uplifting effect. Her out-of-this-world potency makes Gorilla Glue also an excellent strain for the treatment of chronic pains and other health conditions. Zamnesia Seeds – Gorilla Glue: Ultra-Powerful Indica Now Available At Zamnesia! Gorilla Glue turned out outright spectacular. Her THC levels measure 24-26%, with some of her phenos at times reportedly having measured 30%, making her one of the most potent Indicas available. As for the strain’s name, according to cannabis lore the breeders choose the name Gorilla Glue because of the strain’s crazy resin production that made the guys stick to all kinds of things after handling the newly created strain. But her name could also do well to describe GG’s amazingly powerful high that will “glue” you to your couch in awesome relaxation although her effect isn’t just a deep body stone but comes with a greatly balancing euphoria as well. The flowering time of this Indica hybrid is 9-10 weeks with yields that won’t necessarily break records but are still considered medium to moderate. 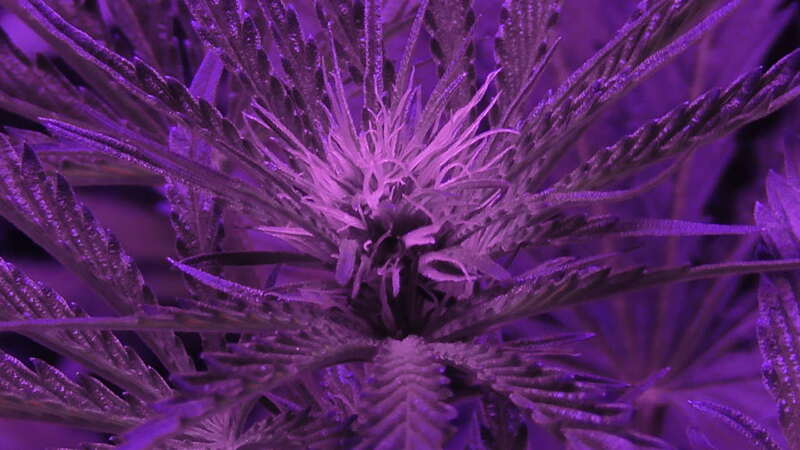 The plant will do well if you grow her indoors under a 600W light. When she grows, Gorilla Glue will develop some sizeable aromatic buds with lime green leaves that will be covered with frosty layers of crystals, not leaving a doubt about her crazy amount of trichomes and the massive resin production which gave the strain her name. With an average THC content of 24%-26% and some of her phenos having observed to contain as much as 30%, Gorilla Glue is an incredibly potent but at the same time still quite balanced smoke. Her powerful effect is incredibly relaxing, just the right thing for stress relief or if you want a superb smoke to help you sleep at night. But her smoke doesn’t just make for awesome chilling at night time, she’ll also give a happy and uplifting feeling at the same time. Because of Gorilla Glue’s potency, she has also become a favourite strain for medicinal users who want a potent herb that can help them with pain relief, depression, sleeping troubles and many other health conditions. With her flavour that blends earthy and sweet notes with hints of lemon and woody pine, Gorilla Glue makes for a superbly tasting smoke on top of her powerful effect. Because of her outstanding qualities, Gorilla Glue has already won loads of awards since her introduction to the cannabis world, including the 2014 Cannabis Cup and 2015 World Cannabis Cup for best hybrid. The famed Gorilla Glue is now exclusively available here in the web shop at Zamnesia! Kann das Produkt erst nach der Ernte richtig bewerten; dann bin ich aber über den Zeitrahmen, in dem ich noch bewerten kann. Schnelle, diskrete Lieferung. Produktbeschreibung hält was sie verspricht. Alle Samen aufgegangen. Schneller Wuchs, zügige Blüte. Reagiert schnell auf zuviele Düngergabe. Wächst eher in Schüben. THC-Gehalt ausserordentlich hoch. Lieber erstmal gering Dosieren und dann langsam rantasten. Für meine Verhältnisse viel zu stark und langanhaltend. Nach dem Rauch, 10std. Geschlafen, danach immernoch sehr benebelt. Teilweise richtige Abstürze geschoben da so eine derart starke Wirkung überhaupt nicht gewohnt. Als geübter Raucher trotzdem eine Herausforderung. Sur trois graines, aucune n'a donné. Les deux premières en laine de roche sont mortes à peine le germe sorti. La troisième, dans du papier absorbant, ne s'est même pas ouverte. C'est la première fois que je n'arrive pas à faire germer des graines, peu importe la technique. Je ne recommande pas. Tailed after 3 day, perfect! Looks like it will be a good grow :)! A red hot grow report on the stickiest green King Kong cannabis strain. Cultivated indoors with LED during the hot summer months. The new marijuana World-star is Gorilla Glue. Scooping High Times Cannabis Cups and any other award of significance since her US debut back in 2014. Gorilla Glue is a real marijuana “dolly mixture” of genetics - accidentally combined with amazing results. Chem’s Sis, Sour Dubb and Chocolate Diesel are reputed to be the dank cocktail that gave the globe the Glue. In the interests of keeping this grow as natural as possible, all be it with a blend of latest grow room technology, the Gorilla Glue was cultivated in a mix of light mix soil, coco coir and perlite. Moreover, as high temperatures did not really become a serious threat to the crop until early bloom CO2 was not added prior to this stage. In hindsight this was an error. Adding CO2 from the start would have been a better idea. Instead of traditional HID lighting, the Dorm Grow G8 LED with 380W actual power draw was the source of illumination from seed to harvest. This piece of kit also helped to keep temps down. 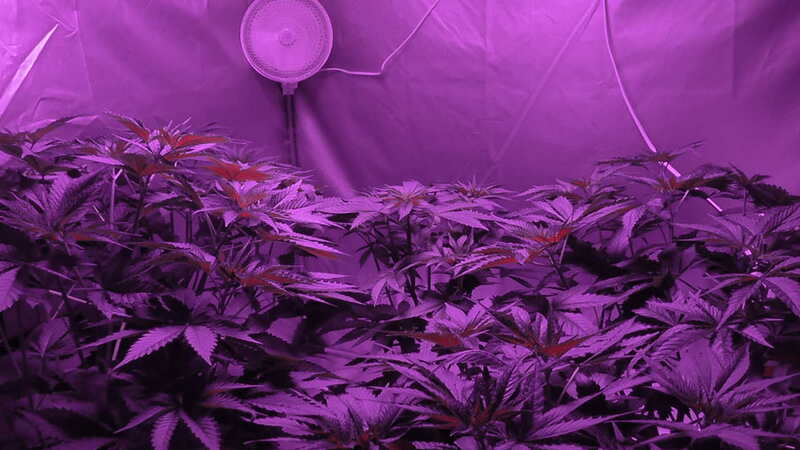 Heat output is minimal in comparison with a comparable 600W old school HPS lamp. 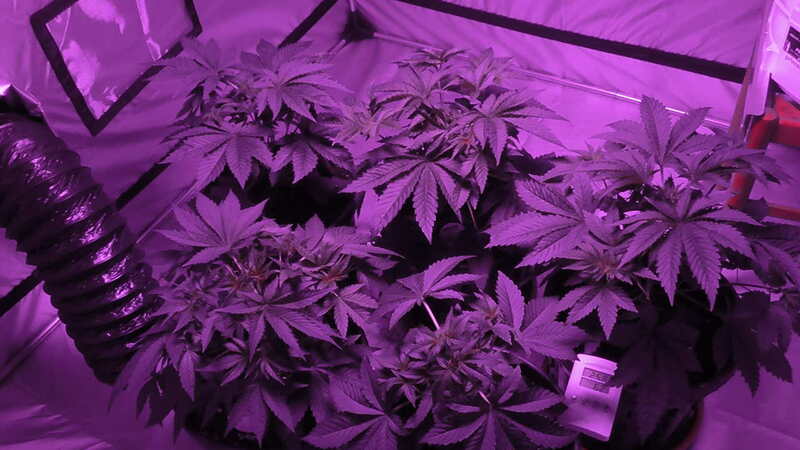 Full spectrum LED facilitated a simple switch of the timer plugs from 18/6 to 12/12 as the Gorilla Glue transitioned from vegetative growth to flowering. Using the good ole damp “Paper Towel” method 3 Gorilla Glue beans by Zamnesia Seeds promptly germinated within 48 hours. Standing a plastic lunchbox vertically in a dark cabinet with a damp bedding of paper towels seldom fails. Moistening the paper towels with the occasional mist of water from a spray bottle. The three tiny Gorilla Glue sprouts with fledgeling tap roots were transplanted directly into 12L air-pots. This was to be their first and final transplant. Minimising transplants is the easy way to eliminate the risk of transplant shock, which can set you back weeks in vegetative growth. Home from now until harvest day would be a 1.5m highly reflective grow tent. Two weeks later and the seedlings were beginning to look like proper little ganja plants. A light dose of micronutrients and pure water were the only weekly feeds required. 18/6 light cycle was maintained and would continue throughout the vegetative stage. After two more weeks 18/6 all three Gorilla Glue were looking indica-dominant and mostly uniform. Wide fat-fingered leaves and a short stocky stature with prolific branching made them perfect candidates for topping. By carefully pruning the apical bud from each plant with a clean scissors the deed was done. After one week all 3 Gorilla Glue had recovered and really filled out lateral grow space quite nicely. Macronutrients and supplements were incrementally increased from 25% doses to 50% strength. Environmental conditions were pretty much optimal with 50% RH and 25°C during lights on. Lights off range were 70% RH and 20°C. High humidity is common in coastal areas such as where this is growing. 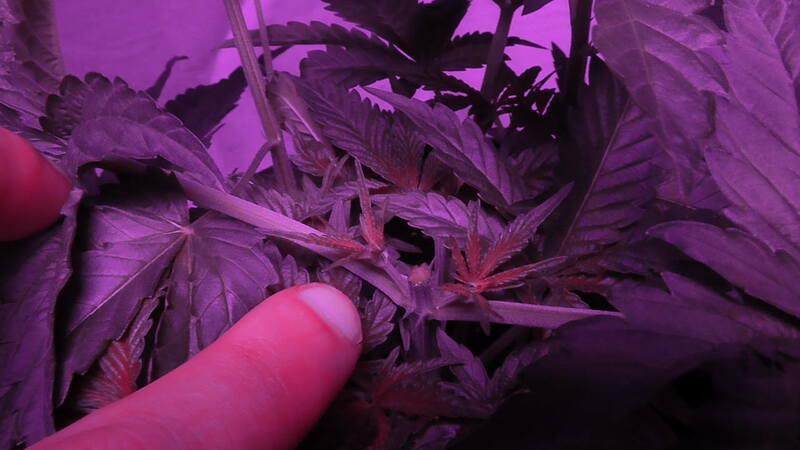 Naturally, multiple top colas instead of one per plant also filled out the canopy. Applying the topping technique is a great way to promote more top colas and utilise cultivation area without packing it with plants like the SOG method. Furthermore, topping diverts growth hormones and helps to reduce stretching. 35 days of 18/6 from seed and the Gorilla Glue were round about 60cm in height and almost as wide. They were ready for the big switch to 12/12. Weeks 1 & 2 were uneventful with a smooth transition from 18/6 to 12/12 at the touch of a button on a digital timer plug. As soon as week 3 hit so did a summer heat wave which was to last for 2 weeks. Even in the weeks after temps were still red hot. CO₂ was desperately needed. Nothing having much laboratory experience I opted for a simple CO₂ bag rather than dabbling with tanks. The introduction of the CO₂ bag to the grow tent and full strength doses of silica (Rhino Skin) kept the grow show on track. Normally the addition of CO2 by a grower is done with the intention of boosting yields. I was more than satisfied that the 33°C temps were not cooking my Gorilla Glue. Strangely RH was about 50% still. Proximity to the sea was most likely the cause. Specific bloom boosters were added in timely fashion as the Glue progressed from early-mid-late bloom. Midway through bloom, perhaps towards the end of week 4, two diverging Gorilla Glue phenotypes were plainly visible. It happened gradually and then suddenly. 2 plants retained the indica look but most definitely could be classed as “stretch indicas” as they passed the 1m and then 1.2m mark by the start of week 6. My remaining tallest Gorilla Glue was most peculiar with far larger internodal spacing. Plus far looser definitely more sativa looking buds forming in long running colas. Almost the opposite of what I expected and vastly different from the chunky indica tops of the others. Just as in the vegetative stage, macro and micronutrient doses were steadily increased. Watering was required daily as the plants developed quite a thirst in the high temps. It was positively Jurassic in the grow tent. Hand watering plants was never so difficult. Feeds were administered by a grower clad only in boxer shorts desperate to escape the sweltering heat before dissolving. A light flushing solution was the final touch in week 9 before all 3 Gorilla Glue were ready for the chop. The indica pair were literally falling over with top-heavy frosty nuggets covered in red hairs. While the sativa looking phenotype was also flopping some as the internal fan hit her long-running colas. One last thing, carbon filters are a must - don’t mess around with the Gorilla Glue; her pungent fuel-piney and Kush-like scent waft out of the grow tent. Both stretch indicas were harvested at day 63 and 65 respectively. While my strange sativa glue took until day 68 to reach her peak. Flower to leaf ratio was very impressive and considering the inferno they were cultivated in, I was pleasantly surprised with the yield from all three plants. GG1 (indica pheno) weighed in with 52g, GG2 (also indica pheno) the keeper and favourite weighed in with a generous 63g. Finally, the sleek sativa produced a respectable 48g. 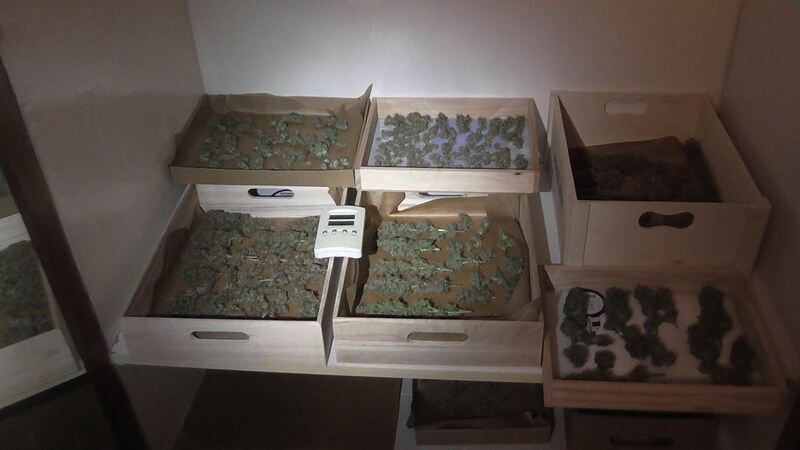 All this fine marijuana was dried slowly in wooden boxes in the wardrobe at room temp and about 50% RH. Dehumidifiers were put in the room to keep the humidity under control. 30% THC? I’m not so sure. Perhaps it’s possible. In the perfect conditions maybe. Hopefully, a home test kit will confirm this. Don’t let me down dude if you are reading this in Denver, Colorado. From personal toking experience, Gorilla Glue is reminiscent of old school Chemdawg in terms of potency, effects and taste. Both of the more indica looking phenos have a creeping heavy body stoned effect. It’s really easy to overdo it. The high actually begins with a very short lived cerebral flurry before the couchlock takes hold sometime later depending on your tolerance. A definite sour flavour accompanies the dank piney aroma. In contrast, the sativa pheno is a far milder smoke with a far more uplifting effect. Her high is longer lasting than the indica phenotype, but far less physical - really quite mellow. So as you have probably guessed this grower is blazing sativa Gorilla Glue by day and indica Gorilla Glue by night. Give the Gorilla Glue a run it’s grrreat. SHORT: Everything you need to know about cultivating the hottest strain on the planet right now. 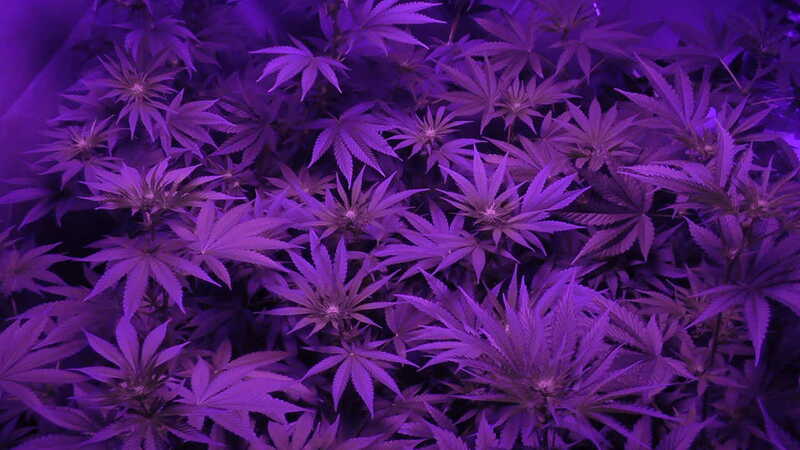 This is how to grow Gorilla Glue with LED indoors during the hot summer months. Study her habits and grow your own top-shelf Gorilla Glue from seed to stash.